Our top picks for different kinds of garage door security measures that will help secure on of the weakest points of your home against intrusion. When was the last time you left your garage door open on accident without thinking? Sleeping late, rushed mornings, and simple absent-mindedness make it easy to forget to close and secure your garage door behind you. But think about the last time you left your front door unlocked; it’s probably a lot harder to remember. According to statistics, 9% of burglars enter through the garage. Even if you leave the garage door open for just a few minutes, the average burglar will spend only 8 to 12 minutes inside the home. That’s all the time it takes to make off with hundreds of dollars of valuables. That loss estimate doesn’t include the most commonly overlooked cost: the increase in your insurance premiums if you file a claim for theft. The following is a list of the best products I’ve found for keeping thieves at bay and guarding against human error. Several years ago, videos appeared all over the web of people opening locked garage doors in six seconds or less. After seeing the video, anyone could emulate the technique. All it required was a wedge to open a gap between the weather sealing and the door and a clothes hanger to reach inside and open the emergency release. This technique is one of the most common ways thieves gain entry into a garage. Many people suggest using zip ties as a cheap, homemade solution. However, the zip ties interfere with the emergency release mechanism and violate several federal regulations as well as UL Code 325. Using a zip tie may also give insurance companies cause to deny your claim if a garage intrusion or accident occurs. To prevent this type of intrusion from happening to your garage, we suggest a garage door shield. 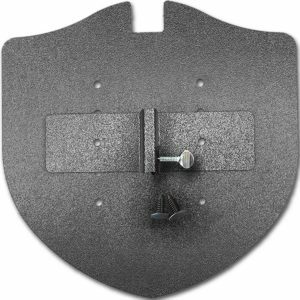 This shield is a device that attaches into the mechanism of the garage door itself, blocking access to the emergency release from outside. We recommend The Garage Shield (available on Amazon). At $19.95, this solution is inexpensive and offers quick installation with no tools required. The Garage Shield is compatible with all modern overhead garage door openers, but it doesn’t work with older styles of garage doors like roller doors, canopy doors, or side hinge doors. Despite this incompatibility, The Garage Shield doesn’t try to be anything more than what it is. The device has a single job that it performs well, making it worth the one-time purchase cost. On those busy mornings when you leave for the office and forget to close the garage door, a timer can provide peace of mind by closing the door when you forget. A sensor on the door measures if the door is open or closed. After a preset amount of time, the sensor triggers the motor to close automatically. Our pick is the Magic Closer. The Magic Closer fits in the palm of your hand and weighs less than a phone, but it eliminates the need to ask yourself if you closed the garage door. At around $39.99 on Amazon, the Magic Closer is affordable. Installation is easy; all you need is a Phillips and a flathead screwdriver. You select from a 5 minute, 15 minute, or 6 hour delay before the Magic Closer automatically closes the garage door. The device will emit visual and audible warnings prior to closing, giving anyone in the vicinity enough time to move out of the way. 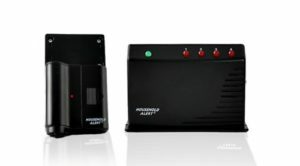 The Magic Closer works with all automatic garage opener brands, although it is not recommended for use with MyQ, Security+ 2.0, and INTELLIG technology. The Magic Closer requires 2 AA batteries, which enables it to continue working even if the power goes out. That said, the batteries reportedly have a life of 3 to 4 months; changing them multiple times a year can be an inconvenience. 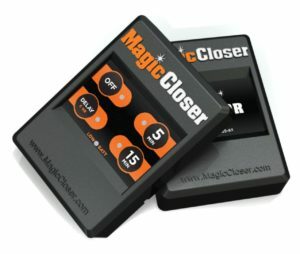 Unfortunately, the Magic Closer doesn’t connect to your smartphone, so you can’t monitor the door remotely with this device. The quick installation, ease of use, and $39.99 price makes the Magic Closer our pick for garage door timers. Despite the lack of extra features, the Magic Closer performs one task well, compared to mediocre performance on multiple tasks. Knowing your garage door will close on its own is worth the price. Reducing the risk of burglary largely revolves around drawing attention to the thief’s actions. Because thieves work with a constant fear of being detected, they are on guard; a loud alarm or siren is often enough to scare them away. If you have an existing security system from a company like Vivint, Frontpoint, ADT, etc.., it’s more than likely that you can add a garage sensor and add it to your professional monitoring plan rather than purchasing an entire system just for your garage. Choosing additional sensors from your existing company may slightly increase the monthly price, but professional monitoring can provide additional peace of mind. Some systems have options for expansions, while others can be converted through the use of MyQ technology. For those without a professional monitoring home security system and don’t intend on purchasing one, we recommend the Skylink Garage Door Alert Kit as a reliable DIY garage security solution. Skylink provides buyers with an easy, do-it-yourself installation. It operates on the same basis as a door alarm; when the sensors lose contact with one another, it triggers the siren. At 95 decibels, the siren will let anyone within 50 feet know something is happening. The system has three separate modes. The first is Alert Mode, which beeps when the garage sensor is activated. The second is the previously mentioned Alarm Mode, which triggers a 95-decibel blast. The final mode is Off, which makes no audible sound. However, all three modes will flash an LED to notify you of movement. An additional sensor lets you know when the battery is low. The security system is expandable to as many as 16 different sensors. You can set more sensors inside your garage or link them throughout your home for a more robust security system. Unlike a number of other security systems, the Skylink monitors more than just entry; sensors can be set up to monitor water leaks, motion, and more. Available for under $30 (available on Amazon), the Skylink Wireless Garage Door Alert Kit offers a vast number of features for the price. However, it isn’t without flaws. There is no way to deactivate the sensor for periods of time; the only option is to set it to Off Mode. The siren also sounds from the receptor, not the alarm itself. While this can be useful if you want to monitor your garage while at home, it doesn’t help deter potential thieves with sound. Of course, you can always set the receptor inside the garage to achieve the desired result. The main garage door is not the only point of weakness. Many garages have a service door on the side that allows entry without opening the front, and all attached garages have a door leading into the home. Most doors are weak around the locks, and you would be surprised at how small the screws are that hold the latch on the door. Interior doors are often thinner than exterior doors, so both the service door of your garage and the door leading from the garage into your home should be exterior doors. 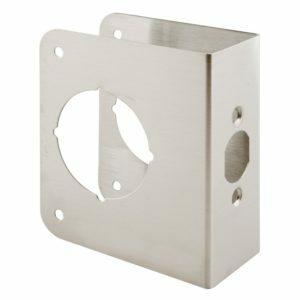 A lock reinforcer is a metal plate that fits around the doorknob. This plate distributes the force of a kick or battering ram and makes splintering the wood around the lock much more difficult, if not impossible. This makes a door exponentially harder to kick in, and thieves will only try two or three times before fleeing—kicking a door draws a lot of attention. Unlike the other items in this list, there isn’t a “best” lock reinforcer. The size you need will vary based on the width of your doors, most of which range from 1 3/4 inches to 2 1/4 inches in thickness. Prime-Line Products (available on Amazon) offers a series of highly rated, affordable lock reinforcers. These reinforcers are easy to paint, allowing them to blend in with the door around them. If you aren’t skilled with tools, installing one can be somewhat difficult. Installation may require sanding down the edge of the door frame to accommodate the reinforcer, but this is not always the case. Many garage doors come with windows. While windows can be a way to let a bit of natural light into an often-dark space, it also grants thieves the ability to see anything of value that’s lying in the open. To keep the natural light but still impede visibility, we recommend investing in window frosting. DC Fix (available on Amazon) sells an inexpensive, self-adhesive film that you can apply to the windows of your garage. It allows light in while blocking the view. Best of all, this film can be removed and reused if you decide to relocate to a new home. A 17.75-inch by 6.56-feet roll of film sells for $10.99. How does garage security work? While it is important to outfit your garage with security measures to reduce the chance of theft and unwanted entry, none are guaranteed protection; even the best anti-theft devices act only as a deterrent for a determined thief. Garage security differs from standard home security in the level of ease with which a thief can gain entry into your home. 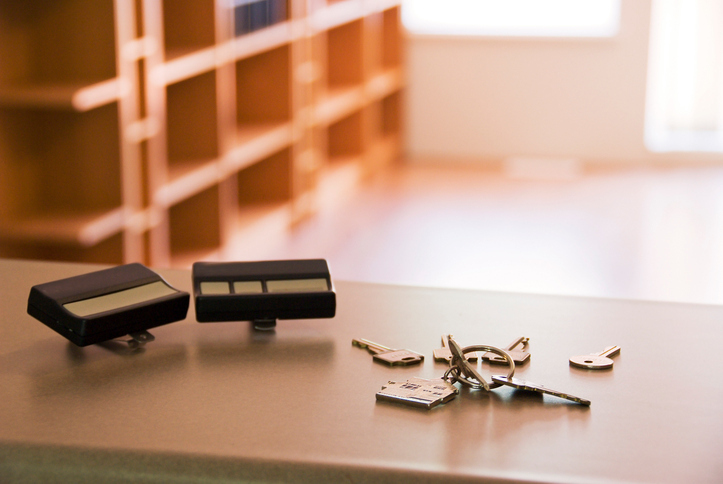 Garage doors are not equipped with as many locks and security mechanisms as the front or back doors of your home. The garage is the most poorly secured entry point into your home, but these devices can remedy that problem. While any one of these products can improve the security of your garage, a better approach is to use several of them in unison. A multi-pronged approach to home security reduces the chance of a thief gaining entry and provides you with valuable peace of mind. There are different levels of security certifications for garage doors. Inspect your garage door and check its rank; make sure your door is of security standard LPS 1175 Issue 516. A reliable alternative to this standard is Warrington’s STS 202 (BRI). The two standards both measure different areas of security. LPS is an abbreviation of ‘loss prevention standard.’ A garage door that is LPS certified has passed a battery of tests guaranteeing its resistance to forced entry. Warrington’s certification is similar in that it covers burglary resistance; a door will sometimes carry both certifications. The standard used depends on the manufacturer or what is required by law in that area.